A majority of elderly people over 60 years of age are not in employment and do not have financial responsibilities, according to the result of a survey carried out by National Institute of Development Administration, or Nida Poll. 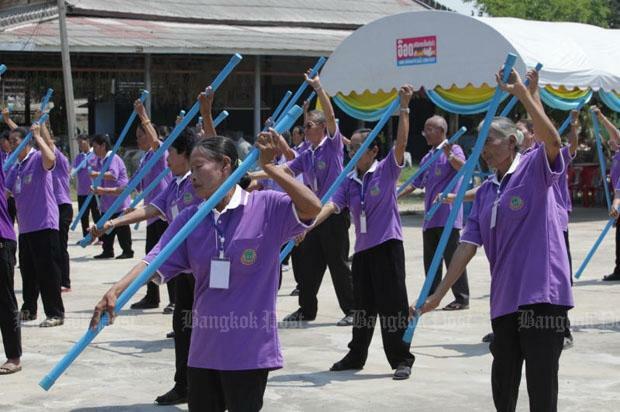 The poll was conducted between March 23 and 28 on 1,250 people aged 60 and over throughout the country to compile information on their employment, income, financial responsibilities, sources of financial assistance and how they make use of the elderly’s subsistence allowance provided by the government. On employment and average income, 63.2% of the respondents said they are no longer in emploment; 23.12% are still working with an everage income of 23,752 baht per month; and 13.68% are working on a daily basis with an average income of 487 baht per day. For the elderly who are no longer working, when asked for reasons, 58.1% said they are already old; 19.62% said they have reached the mandatory retirement; 16.2% said they are in poor health; 15.15% said their children do not want them to work; and, the rest said they simply can’t find employment. Concerning financial responsibilities, a slight majority, 51.68% of the respondennts, said they have no financial burdens while 48.52% said they still have financial responsibilities. Of those who still have financial responsbilities, 49.69% said they have invested in businesses; 27.09% mentioned daily expenses; 17.49% said they are still responsible for housing; 14.24% said they still have to pay instalments for cars, motorcycles, electrical appliances and others; 10.06% said they are still responsible for children’s education; and, 0.77% still have to take care of their parents and spend for other expenses. Asked about assistance in various forms from their children, 24.8% said they regularly get assistance from them; 21.2% do not get any assistance; 17.68% said they occasionally get some money from their children such as on bithdays, New Year or Songkran festival; and 10.56% have no children because they are either unmarried or divorced. Asked who they can rely on when in need of financial help, 47.68% said they will seek help from their children; 9.36% from financial institutions; 7.84% from their spouses; 7.44% from relatives; 3.92% said they rely on themselves; and, the rest are uncertain. To the question on how they make use of the monthly subsistence allowance from the government, 49.54% said they use it for daily expenses; 21.08% said they are not eligible for it; 9.99% said they use it for medical care; 9.01% for merit-making; 5.48% for savings and the rest for other purposes.